Justin Leonard qualified for the United States Ryder Cup team in 1997, 1999, and 2008. In the 1999 event, Leonard made a 45-foot putt for birdie on the 17th hole to complete a remarkable comeback by the U.S. team on the final day. 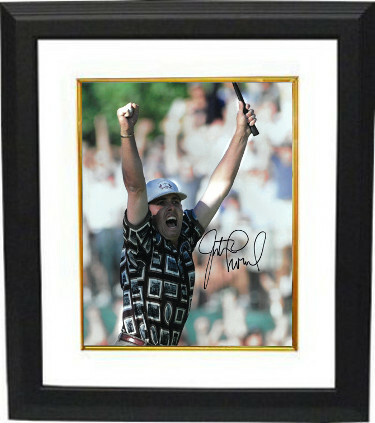 Justin Leonard has hand autographed this 11x14 Photo. Certificate of Authenticity from Athlon Sports Collectibles. Custom White Mat and Premium Black Frame as shown.